Some of the best kept secrets on St. John are off-the-beaten-path beaches. With so many sandy shores lining the island, you are sure to find a beach oasis. However, some are more secluded than others, offering a certain privacy you won’t get at the more well-traveled locations. One of our favorite less-visited beaches is Little Lameshur Bay St. John. This oceanfront stretch is located at the end of a dirt road, mostly used by Virgin Islands National Park rangers. Set apart from the more populated beaches of the island, Little Lameshur Bay St. John is the perfect place for lounging, snorkeling, and hiking. Here’s what you need to know when planning your visit. For more information on our favorite beaches near your CimmaronStJohn vacation home, read our Beach Guide. It features some of the best sandy stretches on the island, like Little Lameshur Bay St. John! The best part about Little Lameshur Bay St. John is that it is secluded from the main roads on the island. This also means that you will have a bit more of a challenge finding it! Fortunately, we have some helpful directions to get you there. Coming from Cruz Bay, at the roundabout, you will take Centerline Road toward Coral Bay. Then, at the bottom of the hill coming into Coral Bay, you’ll arrive at a T-intersection. Here, take a right and travel this winding road for about five miles. You will pass Concordia and Salt Pond. At the end of this paved road, you will continue on the dirt road to the two Lameshur Bays. Vehicles with 4WD or AWD are required. There are so many wonderful places for hiking in St. John. One of the best is the Lameshur Bay Trail just off Little Lameshur Bay St. John. This great trail at the western end of the bay features some nicely preserved and renovated sugar mill ruins. Explore this piece of the past and then branch off to some of the best trails on the island. You can walk the Lameshur Bay Trail to Europa Bay, the Par Force Great House Ruins, Reef Bay Ruins, and some fantastic petroglyphs. Enjoy some time in the outdoors along with some historic relics. 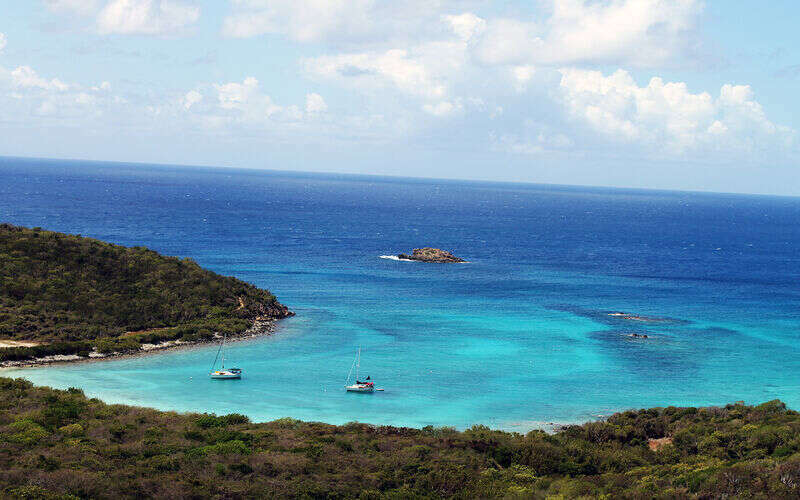 Little Lameshur Bay snorkeling has been rated some of the best of St. John! Though lounging on the beach is also nice, exploring the crystal clear water in search of underwater wildlife is another favorite activity. Snorkeling scenes will include some wonderful patch reefs and seagrass beds, often home to sea turtles! The crescent beach offers a pebbly transition at the waterline, and the apex of the beach is the best place to enter the water for protection from north shore swells. The eastern shore is particularly great for snorkeling, especially if you go all the way around the tip of the peninsula. Watch for waves and currents while enjoying the beauty of St. John reefs beneath the surface! CimmaronStJohn features a variety of villas, condos, and vacation homes on the island. Our rentals come equipped with the very best amenities, including private balconies, full kitchens, beachfront views, and more. After a day at Little Lameshur Bay St. John, you will love returning to your very own private oasis. See you soon in paradise!